Evident in Stroud winning the CSA award for best documentary writer two years in a row, it is no surprise that he has a gift for words. He crafts story telling and interesting information into compelling works whether on screen or the page. Both his books Survive! – Essential Skills and Tactics to Get You Out of Anywhere–Alive! (Harper Collins) and Will to Live have made the New York Times bestseller list. 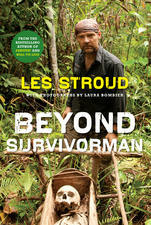 Nominated for Best Travel Writer at the Canadian National Magazine awards, he also released his third book Beyond Survivorman. He is currently writing his fourth book.